What is a Puja Ceremony? Shown here, the Alpenglow team celebrating yesterday on Ama Dablam and also last month on Cho Oyu. 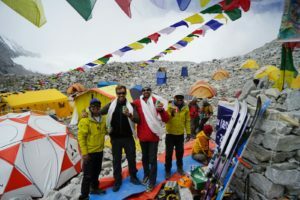 The puja ceremony takes place at base camp before the team climbs higher on the mountain. 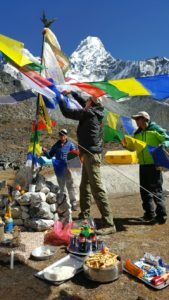 Before every climb the Sherpa perform this prayer ceremony to bless the team, climbing gear, skis and even the beer. Cheers to a safe passage on the mountain! Interested in our international Rapid Ascent expeditions? Click here to check out our website. For questions shoot us an email info@alpenglowexpeditions.com or call the office 877-873-5376.